This is an old revision of this page, as edited by Janus945 (talk | contribs) at 01:23, 12 March 2012 (→‎Predecessors). The present address (URL) is a permanent link to this revision, which may differ significantly from the current revision. This article is about the Western board game. For other chess games or other uses, see Chess (disambiguation). Casual games usually last 10 to 60 minutes; tournament games last anywhere from about ten minutes (blitz chess) to six hours or longer. Chess is a two-player board game played on a chessboard, a square-checkered board with 64 squares arranged in an eight-by-eight grid. It is one of the world's most popular games, played by millions of people worldwide at home, in clubs, online, by correspondence, and in tournaments. Each player begins the game with sixteen pieces: one king, one queen, two rooks, two knights, two bishops, and eight pawns, each of these types of pieces moving differently. Pieces are used to attack and capture the opponent's pieces. The object of the game is to checkmate the opponent's king by placing it under threat of capture ("check") which cannot be avoided. In addition to checkmate, the game can be won by the voluntary resignation of one's opponent, which may occur when too much material is lost, or if checkmate appears unavoidable. A game may result in a draw in several ways, and neither player wins. The course of the game is divided in three phases. The beginning of the game is called the opening (with the development of pieces). The opening yields to the phase called the middlegame. The last phase is the endgame, generally characterized by the disappearance of queens. The first official World Chess Champion, Wilhelm Steinitz, claimed his title in 1886; the current World Champion is Viswanathan Anand. In addition to the World Championship, there are the Women's World Championship, the Junior World Championship, the World Senior Championship, the Correspondence Chess World Championship, the World Computer Chess Championship, and Blitz and Rapid World Championships. The Chess Olympiad is a popular competition among teams from different nations. Online chess has opened amateur and professional competition to a wide and varied group of players. Chess is a recognized sport of the International Olympic Committee, and international chess competition is sanctioned by the FIDE (Fédération Internationale des Échecs or World Chess Federation). 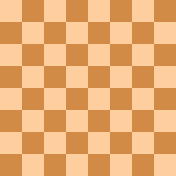 There are also many chess variants that have different rules, different pieces, and different boards. Commencing in the second half of the 20th century, computers have been programmed to play chess with increasing success to the point where home computers can play chess at a very high level. In the past two decades computer analysis has contributed significantly to chess theory as understood by human players, particularly in the endgame. The computer program Deep Blue was the first machine player to overcome a reigning World Chess Champion when it defeated Garry Kasparov in 1997. White always moves first. After the initial move, the players alternately move one piece at a time (with the exception of castling, when two pieces are moved). Pieces are moved to either an unoccupied square or one occupied by an opponent's piece, which is captured and removed from play. With the sole exception of en passant, all pieces capture opponent's pieces by moving to the square that the opponent's piece occupies. A player may not make any move that would put or leave his king under attack. If the player to move has no legal moves, the game is over; it is either a checkmate—if the king is under attack—or a stalemate—if the king is not. * Pawns can optionally move two squares forward instead of one on their first move only. They capture diagonally (black "x"s); they cannot capture with their normal move (black "●"s). Pawns also are involved in the special capture called en passant. Black's king is in check from the rook. White is in checkmate. He cannot escape from being attacked by the Black king and bishops. Stalemate if it is Black to move. It is not checkmate, and since Black cannot move, the game is a draw. Although the objective of the game is to checkmate the opponent, chess games do not have to end in checkmate—either player may resign which is a win for the other player. It is considered bad etiquette to continue playing when in a truly hopeless position. If it is a game with time control, a player may run out of time and lose, even with a much superior position. Games also may end in a draw (tie). A draw can occur in several situations, including draw by agreement, stalemate, threefold repetition of a position, the fifty-move rule, or a draw by impossibility of checkmate (usually because of insufficient material to checkmate). As checkmate from some positions cannot be forced in fewer than 50 moves (such as in the pawnless chess endgame and two knights endgame), the fifty-move rule is not applied everywhere,[note 2] particularly in correspondence chess. Besides casual games without any time restriction, chess is also played with a time control, mostly by club and professional players. If a player's time runs out before the game is completed, the game is automatically lost (provided his opponent has enough pieces left to deliver checkmate). The duration of a game ranges from long games played up to seven hours to shorter rapid chess games, usually lasting 30 minutes or one hour per game. Even shorter is blitz chess, with a time control of three to fifteen minutes for each player, and bullet chess (under three minutes). In tournament play, time is controlled using a game clock that has two displays, one for each player's remaining time. Chess games and positions are recorded using a special notation, most often algebraic chess notation. Abbreviated (or short) algebraic notation generally records moves in the format "abbreviation of the piece moved – file where it moved – rank where it moved". For example, Qg5 means "queen moves to the g-file and 5th rank" (that is, to the square g5). If there are two pieces of the same type that can move to the same square, one more letter or number is added to indicate the file or rank from which the piece moved, e.g. Ngf3 means "knight from the g-file moves to the square f3". The letter P indicating a pawn is not used, so that e4 means "pawn moves to the square e4". If the piece makes a capture, "x" is inserted before the destination square. Thus Bxf3 means "bishop captures on f3". When a pawn makes a capture, the file from which the pawn departed is used in place of a piece initial, and ranks may be omitted if unambiguous. For example, exd5 (pawn on the e-file captures the piece on d5) or exd (pawn on the e-file captures a piece somewhere on the d-file). If a pawn moves to its last rank, achieving promotion, the piece chosen is indicated after the move, for example e1Q or e1=Q. Castling is indicated by the special notations 0-0 for kingside castling and 0-0-0 for queenside castling. A move that places the opponent's king in check usually has the notation "+" added. Checkmate can be indicated by "#" (occasionally "++", although this is sometimes used for a double check instead). At the end of the game, "1–0" means "White won", "0–1" means "Black won", and "½–½" indicates a draw. Chess moves can be annotated with punctuation marks and other symbols. For example "!" indicates a good move, "!!" an excellent move, "?" a mistake, "??" a blunder, "!?" an interesting move that may not be best, or "?!" a dubious move, but not easily refuted. Chess strategy consists of setting and achieving long-term goals during the game – for example, where to place different pieces – while tactics concentrate on immediate maneuver. These two parts of the chess-playing process cannot be completely separated, because strategic goals are mostly achieved by the means of tactics, while the tactical opportunities are based on the previous strategy of play. A game of chess is normally divided into three phases: opening, typically the first 10 moves, when players move their pieces to useful positions for the coming battle; then middlegame; and last the endgame, when most of the pieces are gone, kings typically take a more active part in the struggle, and pawn promotion is often decisive. In chess, tactics in general concentrate on short-term actions – so short-term that they can be calculated in advance by a human player or by a computer. The possible depth of calculation depends on the player's ability. In quiet positions with many possibilities on both sides, a deep calculation is more difficult and may not be practical, while in "tactical" positions with a limited number of forced variations where much less than the best move would lose quickly, strong players can calculate long sequences of moves. Simple one-move or two-move tactical actions – threats, exchanges of material, and double attacks – can be combined into more complicated combinations, sequences of tactical maneuvers that are often forced from the point of view of one or both players. Theoreticians described many elementary tactical methods and typical maneuvers; for example, pins, forks, skewers, batteries, discovered attacks (especially discovered checks), zwischenzugs, deflections, decoys, sacrifices, underminings, overloadings, and interferences. A forced variation that involves a sacrifice and usually results in a tangible gain is called a combination. Brilliant combinations – such as those in the Immortal Game – are considered beautiful and are admired by chess lovers. A common type of chess exercise, aimed at developing players' skills, is showing players a position where a decisive combination is available and challenging them to find it. Chess strategy is concerned with evaluation of chess positions and with setting up goals and long-term plans for the future play. During the evaluation, players must take into account numerous factors such as the value of the pieces on the board, control of the center and centralization, the pawn structure, king safety, and the control of key squares or groups of squares (for example, diagonals, open files, and dark or light squares). The most basic step in evaluating a position is to count the total value of pieces of both sides. The point values used for this purpose are based on experience; usually pawns are considered worth one point, knights and bishops about three points each, rooks about five points (the value difference between a rook and a bishop or knight being known as the exchange), and queens about nine points. 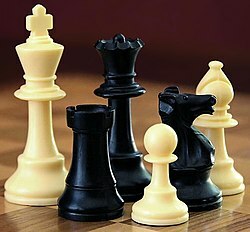 The king is more valuable than all of the other pieces combined, since its checkmate loses the game. But in practical terms, in the endgame the king as a fighting piece is generally more powerful than a bishop or knight but less powerful than a rook. 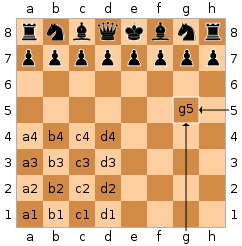 These basic values are then modified by other factors like position of the piece (for example, advanced pawns are usually more valuable than those on their initial squares), coordination between pieces (for example, a pair of bishops usually coordinate better than a bishop and a knight), or the type of position (knights are generally better in closed positions with many pawns while bishops are more powerful in open positions). Another important factor in the evaluation of chess positions is the pawn structure (sometimes known as the pawn skeleton), or the configuration of pawns on the chessboard. Since pawns are the least mobile of the chess pieces, the pawn structure is relatively static and largely determines the strategic nature of the position. Weaknesses in the pawn structure, such as isolated, doubled, or backward pawns and holes, once created, are often permanent. Care must therefore be taken to avoid these weaknesses unless they are compensated by another valuable asset (for example, by the possibility of developing an attack). A chess opening is the group of initial moves of a game (the "opening moves"). Recognized sequences of opening moves are referred to as openings and have been given names such as the Ruy Lopez or Sicilian Defence. They are catalogued in reference works such as the Encyclopaedia of Chess Openings. There are dozens of different openings, varying widely in character from quiet positional play (for example, the Réti Opening) to very aggressive (the Latvian Gambit). In some opening lines, the exact sequence considered best for both sides has been worked out to more than 30 moves. Professional players spend years studying openings and continue doing so throughout their careers, as opening theory continues to evolve. Development: This is the technique of placing the pieces (particularly bishops and knights) on useful squares where they will have an optimal impact on the game. Control of the center: Control of the central squares allows pieces to be moved to any part of the board relatively easily, and can also have a cramping effect on the opponent. King safety: It is critical to keep the king safe from dangerous possibilities. A correctly timed castling can often enhance this. Pawn structure: Players strive to avoid the creation of pawn weaknesses such as isolated, doubled, or backward pawns, and pawn islands – and to force such weaknesses in the opponent's position. Most players and theoreticians consider that White, by virtue of the first move, begins the game with a small advantage. This initially gives White the initiative. Black usually strives to neutralize White's advantage and achieve equality, or to develop dynamic counterplay in an unbalanced position. The middlegame is the part of the game which starts after the opening. There is no clear line between the opening and the middlegame, but typically the middlegame will start when most pieces have been developed. (Similarly, there is no clear transition from the middlegame to the endgame; see start of the endgame.) Because the opening theory has ended, players have to form plans based on the features of the position, and at the same time take into account the tactical possibilities of the position. The middlegame is the phase in which most combinations occur. Combinations are a series of tactical moves executed to achieve some gain. Middlegame combinations are often connected with an attack against the opponent's king; some typical patterns have their own names; for example, the Boden's Mate or the Lasker–Bauer combination. Specific plans or strategic themes will often arise from particular groups of openings which result in a specific type of pawn structure. An example is the minority attack, which is the attack of queenside pawns against an opponent who has more pawns on the queenside. The study of openings is therefore connected to the preparation of plans that are typical of the resulting middlegames. Another important strategic question in the middlegame is whether and how to reduce material and transition into an endgame (i.e. simplify). Minor material advantages can generally be transformed into victory only in an endgame, and therefore the stronger side must choose an appropriate way to achieve an ending. Not every reduction of material is good for this purpose; for example, if one side keeps a light-squared bishop and the opponent has a dark-squared one, the transformation into a bishops and pawns ending is usually advantageous for the weaker side only, because an endgame with bishops on opposite colors is likely to be a draw, even with an advantage of a pawn, or sometimes even with a two-pawn advantage. An example of zugzwang: the side having to move is at a disadvantage. During the endgame, pawns become more important; endgames often revolve around attempting to promote a pawn by advancing it to the eighth rank. The king, which has to be protected in the middlegame owing to the threat of checkmate, becomes a strong piece in the endgame. It is often brought to the center of the board where it can protect its own pawns, attack the pawns of opposite color, and hinder movement of the opponent's king. Zugzwang, a disadvantage because the player has to make a move, is often a factor in endgames but rarely in other stages of the game. For example, the diagram on the right is zugzwang for both sides, as with Black to move he must play 1...Kb7 and let White promote a pawn after 2.Kd7; and with White to move he must allow a draw by 1.Kc6 stalemate or lose his last pawn by any other legal move. Endgames can be classified according to the type of pieces that remain on board. Basic checkmates are positions in which one side has only a king and the other side has one or two pieces and can checkmate the opposing king, with the pieces working together with their king. For example, king and pawn endgames involve only kings and pawns on one or both sides and the task of the stronger side is to promote one of the pawns. Other more complicated endings are classified according to the pieces on board other than kings, such as the "rook and pawn versus rook endgame". The earliest evidence of chess is found in Sassanid Persia around 600, where the game came to be known by the name chatrang. (Persian or Sanskrit:four divisions [of the military] – infantry, cavalry, elephants, and chariotry, represented by the pieces that would evolve into the modern pawn, knight, bishop, and rook, respectively). Chatrang is evoked in three epic romances written in Pahlavi (Middle Persian). According to some texts, Chess is claimed to have originated in northwest India during the Gupta empire, where its early form in the 6th century was known as chaturaṅga. Chatrang was taken up by the Muslim world after the Islamic conquest of Persia (633–644), where it was then named shatranj, with the pieces largely retaining their Persian names. In Spanish "shatranj" was rendered as ajedrez ("al-shatranj"), in Portuguese as xadrez, and in Greek as ζατρίκιον (zatrikion, which comes directly from the Persian chatrang), but in the rest of Europe it was replaced by versions of the Persian shāh ("king"), which was familiar as an exclamation and became the English words "check" and "chess". [note 3] Murray theorized that Muslim traders came to European seaports with ornamental chess kings as curios before they brought the game of chess. Around 1200, the rules of shatranj started to be modified in southern Europe, and around 1475, several major changes made the game essentially as it is known today. These modern rules for the basic moves had been adopted in Italy and Spain. Pawns gained the option of advancing two squares on their first move, while bishops and queens acquired their modern abilities. The queen replaced the earlier vizier chess piece towards the end of the 10th century and by the 15th century had become the most powerful piece; consequently modern chess was referred to as "Queen's Chess" or "Mad Queen Chess". These new rules quickly spread throughout western Europe. The rules about stalemate were finalized in the early 19th century. To distinguish it from its predecessors, this version of the rules is sometimes referred to as western chess or international chess. Writings about the theory of how to play chess began to appear in the 15th century. The Repetición de Amores y Arte de Ajedrez (Repetition of Love and the Art of Playing Chess) by Spanish churchman Luis Ramirez de Lucena was published in Salamanca in 1497. Lucena and later masters like Portuguese Pedro Damiano, Italians Giovanni Leonardo Di Bona, Giulio Cesare Polerio and Gioachino Greco, and Spanish bishop Ruy López de Segura developed elements of openings and started to analyze simple endgames. In the 18th century, the center of European chess life moved from the Southern European countries to France. The two most important French masters were François-André Danican Philidor, a musician by profession, who discovered the importance of pawns for chess strategy, and later Louis-Charles Mahé de La Bourdonnais, who won a famous series of matches with the Irish master Alexander McDonnell in 1834. Centers of chess activity in this period were coffee houses in big European cities like Café de la Régence in Paris and Simpson's Divan in London. As the 19th century progressed, chess organization developed quickly. Many chess clubs, chess books, and chess journals appeared. There were correspondence matches between cities; for example, the London Chess Club played against the Edinburgh Chess Club in 1824. Chess problems became a regular part of 19th-century newspapers; Bernhard Horwitz, Josef Kling, and Samuel Loyd composed some of the most influential problems. In 1843, von der Lasa published his and Bilguer's Handbuch des Schachspiels (Handbook of Chess), the first comprehensive manual of chess theory. The first modern chess tournament was organized by Howard Staunton a leading English chess player and was held in London in 1851. It was won by the relatively unknown German Adolf Anderssen, who was hailed as the leading chess master, and his brilliant, energetic attacking style became typical for the time, although it was later regarded as strategically shallow. Sparkling games like Anderssen's Immortal game and Evergreen game or Morphy's Opera game were regarded as the highest possible summit of the chess art. Deeper insight into the nature of chess came with two younger players. American Paul Morphy, an extraordinary chess prodigy, won against all important competitors (except Howard Staunton, who refused to play), including Anderssen, during his short chess career between 1857 and 1863. Morphy's success stemmed from a combination of brilliant attacks and sound strategy; he intuitively knew how to prepare attacks. Prague-born Wilhelm Steinitz later described how to avoid weaknesses in one's own position and how to create and exploit such weaknesses in the opponent's position. The scientific approach and positional understanding of Steinitz revolutionized the game. Steinitz was the first to break a position down into its components. Before Steinitz, players brought their queen out early, did not completely develop their other pieces, and mounted a quick attack on the opposing king, which either succeeded or failed. The level of defense was poor and players did not form any deep plan. In addition to his theoretical achievements, Steinitz founded an important tradition: his triumph over the leading German master Johannes Zukertort in 1886 is regarded as the first official World Chess Championship. Steinitz lost his crown in 1894 to a much younger player, the German mathematician Emanuel Lasker, who maintained this title for 27 years, the longest tenure of all World Champions. After the end of the 19th century, the number of master tournaments and matches held annually quickly grew. Some sources state that in 1914 the title of chess grandmaster was first formally conferred by Tsar Nicholas II of Russia to Lasker, Capablanca, Alekhine, Tarrasch, and Marshall, but this is a disputed claim. [note 4] The tradition of awarding such titles was continued by the World Chess Federation (FIDE), founded in 1924 in Paris. In 1927, the Women's World Chess Championship was established; the first to hold the title was Czech-English master Vera Menchik. It took a prodigy from Cuba, José Raúl Capablanca (World Champion 1921–27), who loved simple positions and endgames, to end the German-speaking dominance in chess; he was undefeated in tournament play for eight years, until 1924. His successor was Russian-French Alexander Alekhine, a strong attacking player who died as the World champion in 1946. He briefly lost the title to Dutch player Max Euwe in 1935 and regained it two years later. Between the world wars, chess was revolutionized by the new theoretical school of so-called hypermodernists like Aron Nimzowitsch and Richard Réti. They advocated controlling the center of the board with distant pieces rather than with pawns, which invited opponents to occupy the center with pawns, which become objects of attack. After the death of Alekhine, a new World Champion was sought. FIDE, who have controlled the title since then (except for one interruption), ran a tournament of elite players. The winner of the 1948 tournament, Russian Mikhail Botvinnik, started an era of Soviet dominance in the chess world. Until the end of the Soviet Union, there was only one non-Soviet champion, American Bobby Fischer (champion 1972–75). Botvinnik revolutionized opening theory. Previously Black strove for equality, to neutralize White's first-move advantage. As Black, Botvinnik strove for the initiative from the beginning. In the previous informal system of World Championships, the current champion decided which challenger he would play for the title and the challenger was forced to seek sponsors for the match. FIDE set up a new system of qualifying tournaments and matches. The world's strongest players were seeded into Interzonal tournaments, where they were joined by players who had qualified from Zonal tournaments. The leading finishers in these Interzonals would go on the "Candidates" stage, which was initially a tournament, and later a series of knockout matches. The winner of the Candidates would then play the reigning champion for the title. A champion defeated in a match had a right to play a rematch a year later. This system operated on a three-year cycle. Botvinnik participated in championship matches over a period of fifteen years. He won the world championship tournament in 1948 and retained the title in tied matches in 1951 and 1954. In 1957, he lost to Vasily Smyslov, but regained the title in a rematch in 1958. In 1960, he lost the title to the 23-year-old Latvian prodigy Mikhail Tal, an accomplished tactician and attacking player. Botvinnik again regained the title in a rematch in 1961. Following the 1961 event, FIDE abolished the automatic right of a deposed champion to a rematch, and the next champion, Armenian Tigran Petrosian, a genius of defense and a strong positional player, held the title for two cycles, 1963–69. His successor, Boris Spassky from Russia (champion 1969–72), was able to win in both positional and sharp tactical style. The next championship, the so-called Match of the Century, saw the first non-Soviet challenger since World War II, American Bobby Fischer, who defeated his Candidates opponents by unheard-of margins and clearly won the world championship match. In 1975, however, Fischer refused to defend his title against Soviet Anatoly Karpov when FIDE did not meet his demands, and Karpov obtained the title by default. Fischer modernized many aspects of chess, especially by extensively preparing openings. Karpov defended his title twice against Viktor Korchnoi and dominated the 1970s and early 1980s with a string of tournament successes. Karpov's reign finally ended in 1985 at the hands of Garry Kasparov, another Soviet player from Baku, Azerbaijan. Kasparov and Karpov contested five world title matches between 1984 and 1990; Karpov never won his title back. In 1993, Garry Kasparov and Nigel Short broke with FIDE to organize their own match for the title and formed a competing Professional Chess Association (PCA). From then until 2006, there were two simultaneous World Champions and World Championships: the PCA or Classical champion extending the Steinitzian tradition in which the current champion plays a challenger in a series of many games, and the other following FIDE's new format of many players competing in a tournament to determine the champion. Kasparov lost his Classical title in 2000 to Vladimir Kramnik of Russia. The World Chess Championship 2006 reunified the titles. Kramnik beat the FIDE World Champion Veselin Topalov and became the undisputed World Chess Champion. In September 2007, he lost the title to Viswanathan Anand of India, who won the championship tournament in Mexico City. Anand defended his title in the revenge match of 2008. And what say you to the game at chestes? It is truely an honest kynde of enterteynmente and wittie, quoth Syr Friderick. But me think it hath a fault, whiche is, that a man may be to couning at it, for who ever will be excellent in the playe of chestes, I beleave he must beestowe much tyme about it, and applie it with so much study, that a man may assoone learne some noble scyence, or compase any other matter of importaunce, and yet in the ende in beestowing all that laboure, he knoweth no more but a game. Therfore in this I beleave there happeneth a very rare thing, namely, that the meane is more commendable, then the excellency. The knyght ought to be made alle armed upon an hors in suche wyse that he haue an helme on his heed and a spere in his ryght hande/ and coueryd wyth his sheld/ a swerde and a mace on his lyft syde/ Cladd wyth an hawberk and plates to fore his breste/ legge harnoys on his legges/ Spores on his heelis on his handes his gauntelettes/ his hors well broken and taught and apte to bataylle and couerid with his armes/ whan the knyghtes ben maad they ben bayned or bathed/ that is the signe that they shold lede a newe lyf and newe maners/ also they wake alle the nyght in prayers and orysons vnto god that he wylle gyue hem grace that they may gete that thynge that they may not gete by nature/ The kynge or prynce gyrdeth a boute them a swerde in signe/ that they shold abyde and kepe hym of whom they take theyr dispenses and dignyte. III. Caution, not to make our moves too hastily [...]"
With these or similar hopes, chess is taught to children in schools around the world today. Many schools host chess clubs, and there are many scholastic tournaments specifically for children. Tournaments are held regularly in many countries, hosted by organizations such as the United States Chess Federation and the National Scholastic Chess Foundation. Chess is often depicted in the arts; significant works where chess plays a key role range from Thomas Middleton's A Game at Chess to Through the Looking-Glass by Lewis Carroll to The Royal Game by Stefan Zweig and Vladimir Nabokov's The Defense. The thriller film Knight Moves is about a chess grandmaster who is accused of being a serial killer. Chess is featured in films like Ingmar Bergman's The Seventh Seal and Satyajit Ray's The Chess Players. Chess is also present in the contemporary popular culture. For example, J. K. Rowling's Harry Potter plays "Wizard's Chess", while the characters of Star Trek prefer "Tri-Dimensional Chess". The hero of Searching for Bobby Fischer struggles against adopting the aggressive and misanthropic views of a real chess grandmaster. Chess has been used as the core theme of a musical, Chess, by Tim Rice, Björn Ulvaeus, and Benny Andersson. Directmates: white to move first and checkmate black within a specified number of moves against any defense. These are often referred to as "mate in n" – for example "mate in three" (a three-mover). Studies: orthodox problems in which the stipulation is that white to play must win or draw. Almost all studies are endgame positions. Chess composition is a distinct branch of chess sport, and tournaments (or tourneys) exist for both the composition and solving of chess problems. Or 2...h3 3.Ke7 and the white king can support its pawn. Now the white king comes just in time to support his pawn, or catch the black one. Contemporary chess is an organized sport with structured international and national leagues, tournaments, and congresses. Chess's international governing body is FIDE (Fédération Internationale des Échecs). Most countries have a national chess organization as well (such as the US Chess Federation and English Chess Federation) which in turn is a member of FIDE. FIDE is a member of the International Olympic Committee, but the game of chess has never been part of the Olympic Games; chess does have its own Olympiad, held every two years as a team event. The current World Chess Champion is Viswanathan Anand of India. The reigning Women's World Champion is Hou Yifan from China. The world's highest rated female player, Judit Polgár, has never participated in the Women's World Chess Championship, instead preferring to compete with the leading men and maintaining a ranking among the top male players. Other competitions for individuals include the World Junior Chess Championship, the European Individual Chess Championship, and the National Chess Championships. Invitation-only tournaments regularly attract the world's strongest players. Examples include Spain's Linares event, Monte Carlo's Melody Amber tournament, the Dortmund Sparkassen meeting, Sofia's M-tel Masters, and Wijk aan Zee's Tata Steel tournament. Regular team chess events include the Chess Olympiad and the European Team Chess Championship. The 38th Chess Olympiad was held 2008 in Dresden, Germany; Armenia won the gold in the unrestricted event for the second time in a row after Turin 2006, and Georgia took the top medal for the women. The World Chess Solving Championship and World Correspondence Chess Championships include both team and individual events. Besides these prestigious competitions, there are thousands of other chess tournaments, matches, and festivals held around the world every year catering to players of all levels. Chess is promoted as a "mind sport" by the Mind Sports Organisation, alongside other mental-skill games such as Contract Bridge, Go, and Scrabble. Grandmaster (shortened as GM; sometimes International Grandmaster or IGM is used) is awarded to world-class chess masters. Apart from World Champion, Grandmaster is the highest title a chess player can attain. Before FIDE will confer the title on a player, the player must have an Elo chess rating (see below) of at least 2500 at one time and three favorable results (called norms) in tournaments involving other Grandmasters, including some from countries other than the applicant's. There are other milestones a player can achieve to attain the title, such as winning the World Junior Championship. International Master (shortened as IM). The conditions are similar to GM, but less demanding. The minimum rating for the IM title is 2400. FIDE Master (shortened as FM). The usual way for a player to qualify for the FIDE Master title is by achieving a FIDE rating of 2300 or more. Candidate Master (shortened as CM). Similar to FM, but with a FIDE rating of at least 2200. As of August 2011, there are 1363 active grandmasters and 3153 international masters in the world. Top three countries with the largest numbers of grandmasters are Russia, Ukraine, and Germany, with 208, 78, and 76. The country with most grandmasters per capita is Iceland, with 11 GMs and 13 IMs among the population of 310,000.
International titles are awarded to composers and solvers of chess problems and to correspondence chess players (by the International Correspondence Chess Federation). National chess organizations may also award titles, usually to the advanced players still under the level needed for international titles; an example is the Chess expert title used in the United States. In order to rank players, FIDE, ICCF, and national chess organizations use the Elo rating system developed by Arpad Elo. Elo is a statistical system based on the assumption that the chess performance of each player in their games is a random variable. Arpad Elo thought of a player's true skill as the average of that player's performance random variable, and showed how to estimate the average from results of player's games. The US Chess Federation implemented Elo's suggestions in 1960, and the system quickly gained recognition as being both fairer and more accurate than older systems; it was adopted by FIDE in 1970. [note 6] The highest ever FIDE rating was 2851, which Garry Kasparov had on the July 1999 and January 2000 lists. Chess has a very extensive literature. In 1913, the chess historian H.J.R. Murray estimated the total number of books, magazines, and chess columns in newspapers to be about 5,000. B.H. Wood estimated the number, as of 1949, to be about 20,000. David Hooper and Kenneth Whyld write that, "Since then there has been a steady increase year by year of the number of new chess publications. No one knows how many have been printed." There are two significant public chess libraries: the John G. White Chess and Checkers Collection at Cleveland Public Library, with over 32,000 chess books and over 6,000 bound volumes of chess periodicals; and the Chess & Draughts collection at the National Library of the Netherlands, with about 30,000 books. Grandmaster Lothar Schmid owns the world's largest private collection of chess books and memorabilia. David DeLucia's chess library contains 7,000 to 8,000 chess books, a similar number of autographs (letters, score sheets, manuscripts), and about 1,000 items of "ephemera". Ten Geutzendam opines that DeLucia's collection "is arguably the finest chess collection in the world". Mathematicians Euler, Legendre, de Moivre, and Vandermonde studied the knight's tour. The game structure and nature of chess is related to several branches of mathematics. 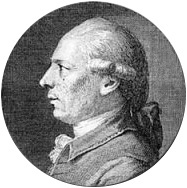 Many combinatorical and topological problems connected to chess were known of for hundreds of years. In 1913, Ernst Zermelo used chess as a basis for his theory of game strategies, which is considered as one of the predecessors of game theory. The number of legal positions in chess is estimated to be between 1043 and 1047 (a provable upper bound), with a game-tree complexity of approximately 10123. The game-tree complexity of chess was first calculated by Claude Shannon as 10120, a number known as the Shannon number. Typically an average position has thirty to forty possible moves, but there may be as few as zero (in the case of checkmate or stalemate) or as many as 218. One of the most important mathematical challenge of chess is the development of algorithms that can play chess. The idea of creating a chess-playing machine dates to the 18th century; around 1769, the chess-playing automaton called The Turk became famous before being exposed as a hoax. Serious trials based on automatons, such as El Ajedrecista, were too complex and limited to be useful. The chess machine is an ideal one to start with, since: (1) the problem is sharply defined both in allowed operations (the moves) and in the ultimate goal (checkmate); (2) it is neither so simple as to be trivial nor too difficult for satisfactory solution; (3) chess is generally considered to require "thinking" for skillful play; a solution of this problem will force us either to admit the possibility of a mechanized thinking or to further restrict our concept of "thinking"; (4) the discrete structure of chess fits well into the digital nature of modern computers. The Association for Computing Machinery (ACM) held the first major chess tournament for computers, the North American Computer Chess Championship, in September 1970. CHESS 3.0, a chess program from Northwestern University, won the championship. Nowadays, chess programs compete in the World Computer Chess Championship, held annually since 1974. At first considered only a curiosity, the best chess playing programs, for example Rybka, have become extremely strong. In 1997, a computer won a chess match against a reigning World Champion for the first time: IBM's Deep Blue beat Garry Kasparov 3½–2½ (it scored two wins, one loss, and three draws). In 2009, a mobile phone won a category 6 tournament with a performance rating 2898: chess engine Hiarcs 13 running on the mobile phone HTC Touch HD won the Copa Mercosur tournament with nine wins and one draw. The best chess programs are now able to beat the strongest human players. With huge databases of past games and high analytical ability, computers can help players to learn chess and prepare for matches. Internet Chess Servers allow people to find and play opponents all over the world. The presence of computers and modern communication tools have raised concerns regarding cheating during games, most notably the "bathroom controversy" during the 2006 World Championship. There is an extensive scientific literature on chess psychology. [note 8][note 9] Alfred Binet and others showed that knowledge and verbal, rather than visuospatial, ability lies at the core of expertise. In his doctoral thesis, Adriaan de Groot showed that chess masters can rapidly perceive the key features of a position. According to de Groot, this perception, made possible by years of practice and study, is more important than the sheer ability to anticipate moves. De Groot showed that chess masters can memorize positions shown for a few seconds almost perfectly. The ability to memorize does not alone account for chess-playing skill, since masters and novices, when faced with random arrangements of chess pieces, had equivalent recall (about half a dozen positions in each case). Rather, it is the ability to recognize patterns, which are then memorized, which distinguished the skilled players from the novices. When the positions of the pieces were taken from an actual game, the masters had almost total positional recall. More recent research has focused on chess as mental training; the respective roles of knowledge and look-ahead search; brain imaging studies of chess masters and novices; blindfold chess; the role of personality and intelligence in chess skill; gender differences; and computational models of chess expertise. The role of practice and talent in the development of chess and other domains of expertise has led to a lot of research recently. Ericsson and colleagues have argued that deliberate practice is sufficient for reaching high levels of expertise in chess. Recent research indicates that factors other than practice are also important. For example, Fernand Gobet and colleagues have shown that stronger players started playing chess at a young age and that experts born in the Northern Hemisphere are more likely to have been born in late winter and early spring. Chess players are more likely to be non-right-handed, though they found no correlation between handedness and skill. Although the link between performance in chess and general intelligence is often assumed, researchers have largely failed to confirm its existence. For example, a 2006 study found no differences in fluid intelligence, as measured by Raven's Progressive Matrices, between strong adult chess players and regular people. There is some evidence towards a correlation between performance in chess and intelligence among beginning players. However, performance in chess also relies substantially on one's amount of experience playing the game, and the role of experience may overwhelm the role of intelligence. Chess experts are estimated to have in excess of 10,000 and possibly as many as 300,000 position patterns stored in their memory; prolonged training is necessary to acquire that amount of data. A 2007 study of young chess players in the United Kingdom found that strong players tended to have above-average IQ scores, but, within that group, the correlation between chess skill and IQ was actually moderately negative, meaning that smarter children tended to achieve a lower level of chess skill. modern variants such as Chess960 invented by Bobby Fischer, where the starting position is selected randomly (from 960 possible positions) to render advance preparation of opening lines impracticable, compelling players to rely on talent and creativity instead. ^ Without this additional restriction, which was added to the FIDE rules in 1972, it would be possible to promote a pawn on the e file to a rook and then castle vertically across the board (as long as the other conditions are met). This way of castling was "discovered" by Max Pam and used by Tim Krabbé in a chess puzzle before the rules were amended to disallow it. See Chess Curiosities by Krabbé. See also de:Pam-Krabbé-Rochade for the diagrams online. ^ The 50 moves rule is not applied at FICGS. ^ At that time the Spanish word would have been written axedrez. The Spanish "x" was pronounced as English "sh", as the Portuguese 'x' still is today. The spelling of ajedrez changed after Spanish lost the "sh" sound. ^ This is stated in The Encyclopaedia of Chess (1970, p.223) by Anne Sunnucks, but is disputed by Edward Winter (chess historian) in his Chess Notes 5144 and 5152. ^ Current FIDE lists of top players with their titles are online at "World Top Chess players". FIDE. Retrieved 2010-07-20. ^ For the official process see "02. FIDE Rating Regulations (Qualification Commission)". FIDE. Retrieved 2008-11-29. ^ Alan Turing made an attempt in 1953. ^ A survey is given in Mark Jeays, "A brief survey of psychological studies of chess". ^ Chess is even called the "drosophila" of cognitive psychology and artificial intelligence (AI) studies, because it represents the domain in which expert performance has been most intensively studied and measured. ^ "Laws of Chess". FIDE. Retrieved 2010-08-03. ^ Bodlaender, Hans. "The rules of chess". Chess Variants. Retrieved 2008-01-07. ^ "50 moves rules". FICGS. Retrieved 2009-12-01. ^ See paragraph "E. Algebraic notation" in "E.I.01B. Appendices". FIDE. Retrieved 2008-11-26. ^ "FIDE Laws of Chess". FIDE. Retrieved 2010-09-04. ^ "Botvinnik vs. Yudovich, USSR Championship 1933". 1933. ^ Banaschak, Peter. "A story well told is not necessarily true: a critical assessment of David H. Li's The Genealogy of Chess ". ^ a b Calvo, Ricardo. "Valencia Spain: The Cradle of European Chess". GoddessChess. Retrieved 2008-11-28. ^ Dr René Gralla. "XiangQi – an alternate to Western Chess". ChessBase.com. ^ René Gralla. "Kramnik plays Makruk Thai". The Chess Variant Pages. Retrieved 2010-12-12. ^ "Louis Charles Mahe De La Bourdonnais". ChessGames. Retrieved 2008-11-26. ^ Bird, Henry Edward. "Chess History and Reminiscences". Gutenberg. Retrieved 2008-11-26. ^ "London Chess Club". ChessGames. Retrieved 2008-11-26. ^ Parr, Larry. "London, 1851". World Chess Network. Retrieved 2008-11-26. ^ "Vera Menchik". ChessGames. Retrieved 2008-11-26. ^ "Kramnik beats Kasparov, 2000". CNN. 2000-11-02. Retrieved 2010-09-04. ^ "Vladimir Kramnik". ChessGames. Retrieved 2008-11-26. ^ "Viswanathan Anand regains world chess title". Reuters. 2007-09-30. Retrieved 2007-12-13. ^ Count Bladessar Castilio; Translated by Sir Thomas Hoby as edited by Walter Raleigh. Online at University of Oregon. Retrieved by Internet Archive, 2008-05-19 (1561). The Second Book of the Courtier. London, 1900: David Nutt. Archived from the original on 2008-05-19. Retrieved 2010-05-07. ^ The Introduction of Printing into England and the Early Work of the Press: The First Book printed in English, from The Cambridge History of English and American Literature, Vol II. (1907) Online at bartleby.com. Retrieved 12 December 2006. ^ Caxton, William. "The Game and Playe of the Chesse". Project Gutenberg. Retrieved 2010-05-20. ^ "Carmina potoria". Bibliotheca Augustana. Retrieved 2008-11-26. ^ "National Scholastic Chess Foundation". Retrieved 2009-12-30. ^ O'Neill, Eamonn. "The Brain Issue" (PDF). Archived from the original (PDF) on 2008-06-26. Retrieved 2008-11-26. ^ "World Chess Federation". International Olympic Committee. Archived from the original on August 22, 2008. Retrieved 2008-11-26. ^ "India's Anand seizes chess title". USA Today. 2007-09-30. Retrieved 2008-11-26. ^ "Judit Polgar: 'I can work myself into the top ten again'". ChessBase. 2007-11-11. Retrieved 2010-08-28. ^ "01. International Title Regulations (Qualification Commission)". FIDE. Retrieved 2008-11-26. ^ "Garry Kasparov". ChessGames. Retrieved 2008-11-29. ^ Susan Polgar, Special Chess Records (February 11, 2008). Retrieved on 2009-1-11. ^ "A collector of chess books and paraphernalia, he has the largest private chess library in the world." David Hooper and Kenneth Whyld, The Oxford Companion to Chess (2nd ed. 1992), p. 358. ISBN 0-19-866164-9. "Schmid owns the largest private collection of chess books and other chess material." Harry Golombek, Golombek's Chess Encyclopedia, Crown Publishers, 1977, p. 290. ISBN 0-517-53146-1. In 1992, Hooper and Whyld stated that Schmid's chess library "is the largest and finest in private hands, with more than 15,000 items". Hooper & Whyld, p. 226 ("libraries" entry). In 2008, Susan Polgar stated that Schmid "has over 20,000 chess books". Dirk Jan ten Geuzendam states that Schmid "boasts to have amassed 50,000 chess books. Dirk Jan ten Geuzendam, "The Finest Chess Collection in the World", New in Chess, 2010, No. 5, p. 18. The title of the article refers to David DeLucia's collection, not Schmid's. ^ ten Geuzendam, p. 19. ^ Cite error: The named reference ten Geutzendam, p. 10 was invoked but never defined (see the help page). ^ Zermelo, Ernst (1913), Uber eine Anwendung der Mengenlehre auf die Theorie des Schachspiels, Proceedings of the Fifth International Congress of Mathematicians 2, 501–4. Cited from Eichhorn, Christoph: Der Beginn der Formalen Spieltheorie: Zermelo (1913), Uni-Muenchen.de. Retrieved 2007-03-23. ^ John Tromp (2010). "John's Chess Playground". ^ Chinchalkar, S. (1996). An Upper Bound for the Number of Reachable Positions. ICCA Journal, Vol. 19, No. 3, pp. 181–183. ^ Chess. Mathworld.Wolfram.com. Retrieved 2006-12-05. ^ "The biggest Number of simultaneous possible legal Moves". ChessBox.de. Archived from the original on 2007-06-13. ^ Alan Turing. "Digital computers applied to games". University of Southampton and King's College Cambridge. ^ Shannon, Claude E. XXII. Programming a Computer for Playing Chess. Philosophical Magazine, Ser.7, Vol. 41, No. 314 – March 1950. Available online at Template:PDFlink Retrieved 2006-12-06. ^ Deep Blue – Kasparov Match. research.ibm.com. Retrieved 2006-11-30. ^ "Hiarcs 13 wins Copa Mercosur". The Week in Chess. Retrieved 2010-09-04. ^ "Cheating Accusations in Mental Sports, Too". The New York Times. 2006-08-08. Retrieved 2010-08-28. ^ Richards J. Heuer, Jr. Psychology of Intelligence Analysis Center for the Study of Intelligence, Central Intelligence Agency 1999 (see Chapter 3). ^ Ericsson, K. A., Krampe, R. Th., & Tesch-Römer, C. (1993). Template:PDFlink Psychological Review, 100, 363–406. Retrieved 2010-05-20. ^ Gobet, F. & Chassy, P. (in press). Template:PDFlink Journal of Biosocial Science. Gobet, F. & Campitelli, G. (2007). Template:PDFlink Developmental Psychology, 43, 159–172. Both retrieved 2007-07-15. ^ Unterrainer, J. M., Kaller, C. P., Halsband U., & Rahm. B. (2006). Planning abilities and chess: A comparison of chess and non-chess players on the Tower of London. British Journal of Psychology, 97, 299–311. Adams, Jenny (2006). Power Play: The Literature and Politics of Chess in the Late Middle Ages. Philadelphia: University of Pennsylvania Press. ISBN 0-8122-3944-X. OCLC 238812746. Binet, A. (1894). Psychologie des grands calculateurs et joueurs d'échecs (in French). Paris: Hachette. OCLC 287413777. Bird, Henry Edward (2008) [First published 1893]. Chess History and Reminiscences. Forgotten Books. ISBN 978-1-60620-897-7. Graham Burgess (2000). The Mammoth Book of Chess. New York: Carroll & Graf. ISBN 0-7867-0725-9. Burgess, Graham; Nunn, John; Emms, John (2004). The Mammoth Book of the World's Greatest Chess Games (2nd ed.). New York: Carroll & Graf. ISBN 978-0-7867-1411-7. * Davidson, Henry A. (1949). A Short History of Chess. New York: D. McKay Co. ISBN 0-679-14550-8. OCLC 17340178.
de la Villa, Jesús (2008). 100 Endgames You Must Know. New in Chess. ISBN 978-90-5691-244-4. Evans, Larry (1958). New Ideas in Chess. New York: Pitman (1984 Dover edition). ISBN 0-486-28305-4. Franklin, Benjamin (2003) . A Benjamin Franklin Reader. New York: Simon & Schuster. ISBN 978-0-7432-5782-4. Retrieved 2010-12-12. Gobet, Fernand; de Voogt, Alex; Retschitzki, Jean (2004). Moves in Mind: The Psychology of Board Games. Hove, UK: Psychology Press. ISBN 1-84169-336-7. OCLC 53962630. Harding, Tim (2003). Better Chess for Average Players. New York: Courier Dover Publications. ISBN 0-486-29029-8. OCLC 33166445. Hartston, William R. (1985). The Kings of Chess. New York: Pavilion Books. ISBN 0-06-015358-X. Holding, Dennis (1985). The Psychology of Chess Skill. Hillsdale, N.J.: Erlbaum. ISBN 978-0-89859-575-8. OCLC 11866227. Hooper, David; Whyld, Kenneth (1992). The Oxford Companion to Chess, Second edition. Oxford; New York: Oxford University Press. ISBN 0-19-866164-9. OCLC 25508610. Howard, Kenneth S (1961). How to Solve Chess Problems. New York: Courier Dover Publications. ISBN 0-486-20748-X. Feng-Hsiung Hsu (2002). Behind Deep Blue: Building the Computer that Defeated the World Chess Champion. Princeton: Princeton University Press. ISBN 0-691-09065-3. OCLC 50582855. Kasparov, Garry (2003a). My Great Predecessors, part I. London; Guilford, CT: Everyman Chess. ISBN 1-85744-330-6. OCLC 223602528. Kasparov, Garry (2003b). My Great Predecessors, part II. London; Guilford, CT: Everyman Chess. ISBN 1-85744-342-X. OCLC 223906486. 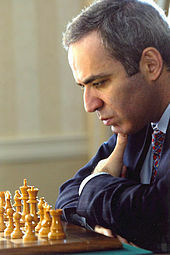 Kasparov, Garry (2004a). My Great Predecessors, part III. London; Guilford, CT: Everyman Chess. ISBN 1-85744-371-3. OCLC 52949851. Kasparov, Garry (2004b). My Great Predecessors, part IV. London; Guilford, CT: Everyman Chess. ISBN 1-85744-395-0. OCLC 52949851. Kasparov, Garry (2006). My Great Predecessors, part V. London; Guilford, CT: Everyman Chess. ISBN 1-85744-404-3. OCLC 52949851. Keene, Raymond (1993). Gary Kasparov's Best Games. London: B. T. Batsford. ISBN 0-7134-7296-0. OCLC 29386838. Lasker, Emanuel (1934). Lasker's Chess Primer. London: Billings (1988 reprint). ISBN 0-7134-6241-8. Leibs, Andrew (2004). Sports and Games of the Renaissance. Westport, CT: Greenwood Publishing Group. ISBN 0-313-32772-6. Levitt, Gerald M. (2000). The Turk, Chess Automaton. Jefferson, N.C.: McFarland & Company. ISBN 0-7864-0778-6. OCLC 226148928. Li, David H. (1998). The Genealogy of Chess. Bethesda, Md. : Premier. ISBN 0-9637852-2-2. OCLC 39281682. Metzner, Paul (1998). Crescendo of the Virtuoso: Spectacle, Skill, and Self-Promotion in Paris during the Age of Revolution. Berkeley: University of California Press. ISBN 0-520-20684-3. OCLC 185289629. Murray, H.J.R. (1913). A History of Chess. Northampton, Mass. : Benjamin Press (originally published by Oxford University Press). ISBN 0-936317-01-9. OCLC 13472872. Olmert, Michael (1996). Milton's Teeth and Ovid's Umbrella: Curiouser & Curiouser Adventures in History. New York: Simon & Schuster. ISBN 0-684-80164-7. Pritchard, David (1994). The Encyclopedia of Chess Variants. Godalming: Games & Puzzles Publications. ISBN 0-9524142-0-1. OCLC 60113912. Pritchard, David (2000). Popular Chess Variants. London: Batsford Chess Books. ISBN 0-7134-8578-7. OCLC 44275285. Robbins, T.W. (1996). "Working Memory in Chess" (PDF). Memory & Cognition: 83–93. Saariluoma, Pertti (1995). Chess Players' Thinking: A Cognitive Psychological Approach. New York: Routledge. ISBN 978-0-415-12079-1. Silman, Jeremy (1998). The Complete Book of Chess Strategy. Los Angeles: Silman-James Press. ISBN 978-1-890085-01-8. Shibut, Macon (2004). Paul Morphy and the Evolution of Chess Theory. New York: Courier Dover Publications. ISBN 0-486-43574-1. OCLC 55639730. Tarrasch, Siegbert (1987). The Game of Chess. New York: Courier Dover Publications. ISBN 0-486-25447-X. OCLC 15631832. Vale, Malcolm (2001). The Princely Court: Medieval Courts and Culture in North-West Europe, 1270–1380. Oxford: Oxford University Press. ISBN 0-19-926993-9. OCLC 47049906. Verwer, Renzo (2010). Bobby Fischer for Beginners. Alkmaar: New in Chess. ISBN 978-90-5691-315-1. Watson, John (1998). Secrets of Modern Chess Strategy. London: Gambit Publications. ISBN 978-1-901983-07-4. Weissberger, Barbara F. (2004). Isabel Rules: Qonstructing Queenship, Wielding Power. Minneapolis: University of Minnesota Press. ISBN 0-8166-4164-1. OCLC 217447754. Yalom, Marilyn (2004). Birth of the Chess Queen. New York: Harper Collins Publishers. ISBN 0-06-009064-2. Dunnington, Angus (2003). Chess Psychology: Approaching the Psychological Battle Both on and Off the Board. Everyman Chess. ISBN 978-1-85744-326-4. Fine, Reuben (1983). The World's Great Chess Games. Courier Dover Publications. ISBN 0-486-24512-8. OCLC 9394460. Hale, Benjamin (2008). Philosophy Looks at Chess. Open Court Publishing Company. ISBN 978-0-8126-9633-2. Rizzitano, James (2004). Understanding Your Chess. Gambit Publications. ISBN 1-904600-07-7. OCLC 55205602. Chess records – details of longest game, most passed pawns, fewest captures etc.